Catalonia is the perfect destination for cultural, gastronomy, shopping, luxury, cruising, sports events and MICE trips. Catalonia and its capital city, Barcelona, is purely Mediterranean Situated in the North-East of Spain, close to France and Italy. Catalonia is Spain’s top tourist destination and the second most popular in Europe after the Paris region. Along with Spanish, Catalonia has also its own language, Catalan, and its own distinctive identity. The intercontinental airport of Barcelona is the perfect gateway to Catalonia, the rest of Spain and Europe. Emirates, Qatar Airways, and Turkish Airlines connect India with Barcelona and Catalonia via Dubai, Doha, and Istanbul, respectively, amongst many other European national carriers. 3 additional international airports (Girona, Reus – Tarragona & Lleida – Alguaire) and an extensive modern high-speed rail network also enable Indian visitors to reach from Barcelona destinations such as Valencia, Bilbao, Madrid, Salamanca, Granada, Seville, in Spain, and also Switzerland, London, Edinburgh, Rome, Florence, Venice, Vienna, Paris, Amsterdam, Prague, The French Riviera, The Alps, The Danube River and many other iconic “musts” in Europe. With the Mediterranean Sea as a backdrop, vibrant Barcelona offers a seductive cocktail of beaches, history and a legendary nightlife. 40 minutes away on the road towards the coastal towns of the Costa Brava, La Roca Village is the perfect day trip for sensational shopping and lunch with a distinctive Mediterranean flavour. Catalonia offers the visitor an incredibly diverse range of cultural and natural attractions across its 32,000 square kilometres. Its capital Barcelona is the second largest meetings and events destination in the world and the host of EIBTM, Europe’s main MICE exhibition, Barcelona also hosts the Mobile World Congress, the world’s most important mobile phone event. Catalonia is a land of Mediterranean sea, the Pyrenees mountains, Romanesque World Heritage Site churches, Gaudi’s modernism, shopping, golf, sport, luxury, wellness and some of the best cuisine in the world. Catalonia’s cultural offer is diverse and allows visitors following the trace of different architectural styles (Romanesque, Gothic, Modernist, etc. ), well-known writers and great artistic geniuses such as Dalí, Picasso, Gaudí, Miró and Tàpies. Montserrat monastery and mountain which is much more than just a protected natural area. Palau de la Música Catalana. Barcelona. Modernism. Hospital de Sant Pau. Barcelona. Modernism. Poblet Monastery. Tarragona. the largest Cistercian monastery in Europe. Mediterranean cave art in the Iberian Peninsula. There are 27 sites in Catalonia with listed paintings found in caves, grottoes and shelters. Park Güell. Barcelona. First garden city experience. La Pedrera (Casa Milà). Barcelona. La Patum. UNESCO declared the ancestral La Patum festival in Berga (Barcelona), a Masterpiece of Intangible Cultural Heritage of Humanity. Castellers. A genuine piece of Catalan folk culture featuring up to ten-storey human towers, it was recognised by UNESCO as Intangible Cultural Heritage of Humanity in 2010. Gastronomy is a part of a nation’s cultural heritage. Catalan cuisine dates back to times immemorial, with a long tradition of recipes gathered in ancient handbooks. Catalonia is playing an international leading role in gastronomy. Catalonia features 60 stars in the 2013 Michelin Guide. Topping the list the two restaurants that have received 3 stars: Sant Pau, of Carme Ruscalleda and el Celler de Can Roca, of Joan Roca, which has been recentely named as the best restaurant in the world. La Roca Village is one of the nine Chic Outlet Shopping® Villages in Europe. Chic Outlet Shopping® is the Collection of luxury outlet villages by Value Retail, the only company to specialise exclusively in the development and operation of luxury outlet shopping villages. Currently home to more than 900 boutiques, the Villages offer the authentic previous seasons’ collections of leading luxury fashion and lifestyle brands with savings of up to 60%, and sometimes more, on the recommended retail price, all year round. Cruise tourism has equally increased considerably in recent years following improvement works in the port, which has become the biggest cruise port in Europe. The Port of Barcelona has 7 international passenger terminals and is the leading european cruiser port and a Mediterranean turnaround base. Last year, 2012, the Port of Barcelona received 2.408.634 creuse passangers. The Catalonia – Barcelone Speed Circuit has set itself up as a modern sports facilities, serving as the venue for the most important motor sport events of the world such as the Spanish Formula One Grand Prix and the Catalan MotoGP Grand Prix. But the Circuit is not only about passion for speed; it also offers the chance to organise all kinds of events and activities for companies thanks to the multi-purpose facilities. Circuit de Barcelona – Catalunya has 22 years’ experience organising events at the highest levels of the motor racing world, Formula 1 Spanish Grand Prix and the Catalan MotoGP Grand Prix being the best examples. The Circuit de Barcelona – Catalunya is the port of entry for Formula 1 in Europe and it is the chance to get a live shot of the drivers and teams who bring us the most spectacular motor racing display in the world. FC Barcelona’s Camp Nou stadium is one of the icons of the city of Barcelona. Almost 100,000 spectators can enjoy magnificent nights in the biggest and most spectacular stadium in Europe, which was granted five-star status by the UEFA. and bar service, hostess, CCTV and match line-ups. The Hospitality Programme. Denying any sexual harassment of a young woman law intern, former Supreme Court judge Justice A K Ganguly on Friday said he was "shocked and shattered" by the charges against him. "I am denying everything. I have told the committee that all the allegations levelled by the intern are wrong. I don't know how such allegations have been levelled against me," he told mediapersons. He was giving his reaction after an apex court official released a statement that Justice Ganguly had recorded his statement before a three-judge committee that went into the intern's allegations and has submitted its report to the Chief Justice of India. The apex court official statement said Justice Ganguly had recorded his statement to the three-judge committee headed by Justice R M Lodha. The report was handed over to CJI Justice P Sathasivam on Thursday. "I totally deny the allegations. I am a victim of situations," he told television channels. "I am not ashamed of anything," he said in reply to a question in regard to the alleged episode which came out in public domain after the intern spoke about in a legal portal earlier this month. He said the charges against him were totally wrong. The girl had not raised any sexual harassment issue with him, he said, adding that he had not done any physical harm to her. The former judge said the intern worked with him though she was not officially allocated to him. She came in the place of another intern who had gone abroad after marriage. "I never put up a poster. She came on her own." He said the girl had come to his house on a number of occasions in connection with the work. Asked about the charge that he had asked her to come to a hotel room, Justice Ganguly said he was in Delhi at that point of time in connection with work and she was also in Delhi. "I know what she has said. The question is that when I was in Delhi she was also in Delhi. She came on her own to my...," he said. "If anybody feels uncomfortable to work with me she was free to leave," he said, adding that there was inconsistency that she has respect for him and there was no rancour. He said that the intern was like his child and he treated her that way. Asked if he was worried whether the three-judge committee will pass strictures against him, he said, "I don't know what kind of strictures will be there." To another question if he felt that the committee could have preconceived notions about him, he said,"I am not saying anything." Asked whether the allegations have cast a shadow on him, he said, he has faith in people and the people will judge him by his "conduct" and by his judicial work. Justice Ganguly, who demitted office on 12th February last year, said that if this trend continues it will be difficult for the upright judges to continue to work. "I have worked with several interns in my life, a large number of them and I treat them like my children. They are all well placed in several places in their lives and nobody has made such allegations. I am shocked and shattered." He said that his case be not compared with that of Tarun Tejpal. "Don't compare this case with Tejpal. Please," he told to a television channel. To a question if asked to prove ..., Justice Ganguly shot back "how can I prove the negative." The apex court committee recorded the statement of Justice Ganguly, who is at present heading West Bengal Human Rights Commission, after recording the statement of the law intern. "The committee constituted to inquire into the allegations of sexual harassment levelled by the law intern against a former SC judge held its meetings on November 13, 18, 19, 20, 21, 26 and 27. "The statement of law intern was recorded. She had also submitted three affidavits. The statement of Mr. Justice (retired) A K Ganguly has also been recorded by the committee. The committee has submitted its report to the CJI on 28th November," the official said in a statement. The official, however, did not give any details of the findings of the committee comprising Justices R M Lodha, H L Dattu, and Ranjana Prakash Desai which was constituted by the CJI on 12th November. Hit by allegations of sexual misbehaviour by one of its judges, the Supreme Court constituted a three-judge committee to go into the charge of a woman intern that she was sexually harassed last December by the judge. Justice Ganguly was elevated to Supreme Court on 17th December, 2008 and superannuated on 3rd February, 2012. The intern, in a blog, had accused the retired judge of having misbehaved with her in a hotel room last December when the nation was grappling with the gangrape of a 23-year-old woman in the capital. On 18th November, the intern appeared before the panel and gave details of the incident and on 21st November, she had sent certain applications and affidavits to the panel. While setting up the panel on 12th November, Justice Sathasivam had observed that he was concerned as head of the institution (judiciary). "In the cases of sexual harassment, we cannot take it lightly," the CJI had said. Nearly 1,500 anti-government protesters in Bangkok have broken into the compound of the Royal Thai Army headquarters in their bid to topple the current government. The largely non-violent action could escalate, police say. “We want to know which side the army stands on,” shouted one protester, according to Reuters. The protesters gathered at the compound’s front gates, forcing them open and flooding the premises, as they demanded for the head of the country’s armed forces generals to choose whether they stand with the people or with the government of PM Yingluck Shinawatra. This took place while 100 soldiers stood guard. Furthermore, the Bangkok police now fears that the situation could indeed escalate into a violent confrontation. “We have received intelligence reports that there could be violence tonight and tomorrow… we are increasing security around key government and royal buildings.” They said in a statement. Although Thailand’s military has been publicly supported by the ruling party, it has remained largely on the sidelines of the current conflict. Elsewhere in the capital, about a 1,000 people seeking to oust Prime Minister Yingluck Shinawatra gathered outside the headquarters of her ruling part, shouting for them step down. Director of Serbian film ‘The Whirlpool’, Bojan Vuk Kosovcevic said that his film gives the message that through violence you will never get anything good. During a media interaction, ‘Meet the Director’ at the 44th International Film Festival of India (IFFI) in Panjim, Goa today, he said, Indian films are liked by Serbian people for their artistic appeal. He said that ‘The Whirlpool’, is set in the second half of the 1990s in Belgrade against the backdrop of disintegration of Yugoslavia and its socio-economic impact on Serbia. He said that social extremes were apparent everywhere in Serbia especially among the youth during the collapse of Serbia. He said that due to war, inflation, physical isolation and sanctions, Serbia was becoming a kind of closed society, which was most visible in Serbia’s capital, Belgrade. He said, his film ‘The Whirlpool’ is about this isolated environment, where the young begun to create their own worlds. It is seen from the perspectives of those youth who were becoming adults, and about their efforts to find themselves getting sucked into a chaotic whirlpool of violence. Agriculture Minister, Shri Sharad Pawar, today offered the Central Government’s full support for fast growth in all areas of agriculture and food processing in Arunachal Pradesh. He made the offer while laying the foundation stone of the State’s first agriculture college and inaugurated a krishi mela at Pasighat today. The Minister appreciated the recent initiatives taken by the State Government towards fast growth of agriculture, rice procurement, new plantations, export of fruits, etc. He expressed the hope that the state will be able to exploit its vast potential in horticulture and floriculture. Giving the details of the support given by Agriculture and Food Processing Industries Ministries to the State, the Minister said : “This year we have allocated more than 15 Cr for NFSM, 32 Cr for RKVY and 48 Cr for Horticulture Mission. I am extremely liberal while supporting this state and has told my officers that if state is ready to absorb more funds, we should readily provide the same. We also appreciated that some areas of Arunachal Pradesh can produce oil palm and hence this year we included Arunachal Pradesh also under oil palm development scheme. I am also of the considered opinion that Arunachal has tremendous potential in bamboo development. The state has not yet used its fullest capacity to harness the benefit from the national bamboo mission. The state also needs to work on a mission mode on other plantation crops like rubber etc. Andhra Pradesh is on a high alert for the very severe cyclonic storm 'Lehar', which is expected to cross the coast around November 28 noon. The very severe cyclonic storm over southeast Bay of Bengal moved westwards with a speed of 15 kmph in the past six hours and lay centred at 1130 hours today, about 920 km east-southeast of Kakinada in coastal Andhra, an official bulletin said in Hyderabad today. The system would intensify further and move west-northwestwards and cross Andhra coast between Machilipatnam and Kalingapatnam around November 28 noon, it said. Under the influence of the system, moderate rainfall at many places would commence from November 27 afternoon over north coastal Andhra Pradesh and south coastal Odisha. Its intensity would gradually increase with rainfall being witnessed at most places and heavy to very heavy rainfall at a few places. Isolated extremely heavy falls would occur over north coastal Andhra Pradesh on November 28. Squally winds, with speed reaching 45-55 kmph gusting to 65 kmph, would commence along and off Andhra Pradesh and south Odisha coasts from November 27 evening. It would increase in intensity with gale wind speed reaching 170-180 kmph gusting to 200 kmph along and off coastal districts of Krishna, West and East Godavari and Vishakhapatnam districts and 120-130 kmph gusting to 140 kmph over Vizianagaram, Srikakulam and Guntur districts of coastal Andhra Pradesh at the time of landfall, the bulletin said. The very severe cyclonic storm is expected to cause extensive damage to agriculture crops, kutcha houses and disrupt power and communication lines and also disrupt rail and road traffic. The bulletin has advised total suspension of fishing operations and fishermen out at sea along and off Andhra Pradesh and south Odisha coasts have been advised to return to coast. It also advised evacuation from coastal areas and judicious regulation of rail and road traffic. People in affected areas have been advised to remain indoors. The government has already put the Collectors of coastal districts on high alert and announced a number of measures to deal with the situation. The East Godavari district has announced holiday for educational institutions on Wednesday and Thursday and also asked the owners of small shops not to operate. India and Malaysia signed a Memorandum of Understanding (MoU) on Monday to strengthen co-operation in public administration and governance as part of the efforts to enhance their strategic partnership. The MoU covers eight areas of co-operation including human resource management, e-governance, public delivery system, accountability and transparency, skills and capacity building and quality results. The MoU was signed by Malaysia's Public Service Department Director-General Mohamad Zabidi Zainal and the Secretary of India's Department of Administrative Reforms and Public Grievances of Ministry of Personnel, Public Grievances and Pensions, Sanjay Kothari. Zabidi said the MoU was a strategic cooperation and collaboration to strengthen ties between the two countries. He added that apart from that it could also assist in socio-economic development through an efficient, accessible, transparent and accountable civil service. The MoU envisages cooperation via tours, workshops and conferences, sharing of public administration and governance information and expertise, common project implementation mechanisms and exchange of publications, state-run news agency Bernama said. Greetings from The German National Tourist Office, India. Newdelhi, November 25 : The Shiromani Akali Dal lambasted the PPCC Spokesman Mr. Sukhpal Singh Khaira for his comments justifying 1984 sikh massacre and described the statement as double standards of the Congress leader. Reacting strongly to the statement of Mr. Khaira, the SAD Secretary and Spokesman Dr. Daljit Singh Cheema said that during a workshop of Congress party’s spokespersons in Delhi Mr. Khaira himself had questioned the party high command that how should the spokespersons justify 1984 massacre before the media ? But it is ironical to see the same PPCC Spokesman now coming with a strange logic to defend the Congress in Delhi state assembly elections. Dr. Cheema further said that on one hand the Congress party has given a ticket to the son of Mr. Jagdish Tytler, prime accused in 1984 anti sikh riots, sending the impression that Congress party still stands committed to the second generation of perpetrators of crime against Sikhs and on the other hand the Congress leaders are shredding crocodile tears in the streets of Tilak Nagar of Delhi which has suffered the most during 1984 anti sikh riots. The Shiromani Akali Dal urged the Election Commision of India to conduct an enquiry into the registration of bogus votes in 27- Rajouri Garden Assembly Constituency. In a written complaint filed by the Shiromani Akali Dal Secretary and Spokesman Dr. Daljit Singh Cheema the SAD alleged that 266 bogus votes have been registered in Khayala village which is the native place of official candidate of Indian National Congress Party Mrs. Dhanwanti Chandila. Dr. Cheema alleged that in two small plots bearing house nos WZ 101 and WZ 102, 93 & 142 bogus votes have been registered respectively and 42 votes have been registered in the same houses in the supplementary voter list issued by the returning officer. Dr. Cheema informed the commission that it is surprising to see that in the same houses five years ago a similar complaint of registration of bogus votes was filled by Shiromani Akali Dal on 25 November, 2008. In that case the house nos were also WZ 101 & WZ 102. The Shiromani Akali Dal demanded immediate deletion of all bogus votes, strict punishment to the guilty officials and strict action against the Indian National Congress party candidate Mrs Chandila. Indonesia has ordered the evacuation of 15,000 people from their homes near an active volcano as it pushed up the alert for emergency to the highest levels. Officials on Sunday raised the volcanic alert for Mount Sinabung, on Sumatra, after it began throwing clouds of ash, gravel and gas as high as 5,000m, according to government volcanologists but no casualties have been reported so far. there will be more eruptions and because the intensity of eruptions has been increasing,” the National Disaster Mitigation Agency said in a written statement. About 6,000 people have already been moved from the area, 88km from Medan, the capital of North Sumatra province, and were placed in 16 safe locations. Authorities narrowed the evacuation radius to 5km from 3km and the military geared up to move residents out. The conservative ruling party Prez candidate has claimed victory in Honduras’ presidential election as an early vote count put him ahead, but his leftist rival also said she was the winner, setting the stage for a conflict. Electoral authority late on Sunday said a partial count of votes gave National Party candidate, Juan Hernandez, 34 percent support while Xiomara Castro, wife of deposed former leader Manuel Zelaya, had 28.5 percent. The preliminary tally was based on a count from 43 percent of polling booths. Final results are expected on Monday. A Hernandez victory would deal a blow to Zelaya, who was ousted in a 2009 coup that plunged Honduras into a political crisis. He had hoped to stage a political comeback behind Castro. Honduran Election Tribunal has consistently been called into question by Castro’s Libre Party. The party has also warned of fraud and voter intimidation. Castro was campaigning to become the first female president of Honduras, the poorest country in the Americas after Haiti with an estimated 71 percent of the population living in poverty.”The people have decided, and the people want change,” she said after voting in Catacamas. “A new era has started for all Hondurans. Lots of cheering supporters welcomed Iranian negotiators arrival home. Iran has agreed to curb some of its nuclear activities in return for about $7bn in sanctions relief. Israel called the deal a “historic mistake”. Carrying flowers and Iranian flags at Tehran’s Mehrabad airport, crowds hailed Iran’s foreign minister, Mohammed Javad Zarif, as an “ambassador of peace” and chanted, “No to war, sanctions, surrender and insult”. Are you in Iran? What are your thoughts on the deal? What difference will the sanctions relief make to your life. Let us know. US Secretary of State Kerry assured Israel will be safer over the next six months due to the agreement reached in Geneva concerning Iran’s nuclear program and uranium enrichment plan. Though “Israel is threatened by what has been going on in Iran”,the deal brokered on Saturday will keep the Islamic Republic’s nuclear program under supervision and control, said John Kerry. “But I believe that from this day – for the next six months – Israel is in fact safer than it was yesterday because we now have a mechanism by which we are going to expand the amount of time in which they (the Iranians) can break out (toward making a nuclear bomb),” he told CNN. The much-anticipated agreement reached in Geneva gives Iran initial relief from sanctions in exchange for halting its enrichment of uranium to above 5 per cent for six months. The US and Iran secretly engaged in a series of high-level talks over the past year, according to an AP report. The negotiations were allegedly hidden even from America’s key ally in the region, Israel. The talks were held in the Middle Eastern nation of Oman and were personally authorized by President Barack Obama, the report claims. It says that since March top US officials – Deputy Secretary of State William Burns and Jake Sullivan, Vice-President Joe Biden’s foreign policy adviser – have met at least five times with Iranian diplomats. The last four meetings were held after Iran’s President Hassan Rouhani was inaugurated in August and were very productive, three senior administration officials told AP on condition of anonymity. EU will likely ease sanctions in place against Iran in December, said French Foreign Minister Laurent Fabius. The announcement comes hot on the heels of a landmark deal over Tehran’s nuclear program that ended a decade of diplomatic deadlock. The European Union will ease sanctions imposed on Tehran “in December,” the French foreign minister told radio Europe 1 on Monday. Fabius added that a meeting between EU foreign ministers had been scheduled for the coming weeks to discuss the lightening of the sanctions. “We are doing the same as the American side,” said Fabius. The P5+1 reached a deal with Iran in the early hours of Sunday morning that will allow Tehran access to $4.2 billion in funds frozen as part of the financial penalties imposed on the country. “Iran cannot do whatever it wants, there are specific limitations,” he said. After the deal was clinched the international community has diverged somewhat in its interpretation of what it means for Iran’s nuclear program. Iran’s Deputy Foreign Minister Seyed Abbas Araghchi wrote on Twitter that the right to enrichment had been recognized in negotiations. Russian Foreign Minister Sergey Lavrov intimated that Iran’s right to enrichment has been acknowledged. “This deal means that we agree with the need to recognize Iran’s right for peaceful nuclear energy, including the right for enrichment, Lavrov told Russian press following negotiations. In contrast Washington said that while it accepted Tehran’s right to a “peaceful nuclear program,” its right to enrichment had not been acknowledged. “The first step, let me be clear, does not say that Iran has a right to enrich uranium,” said Secretary of State John Kerry on Sunday. Some 500 pro-EU protesters were rallying in the Ukrainian capital’s Europe Square on Monday morning, RIA-Novosti reported, citing police in Kiev. 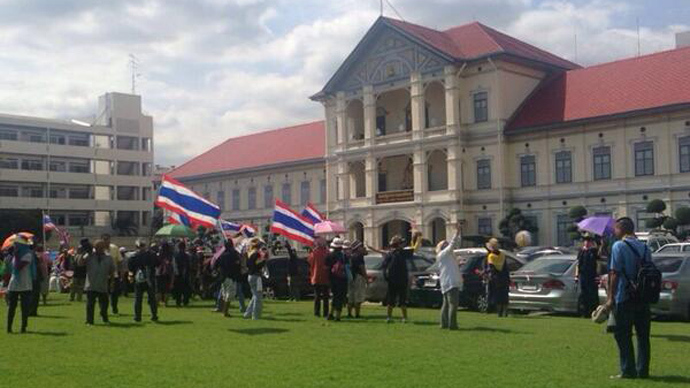 Another 50 people gathered on Independence Square. Nobody was detained during the morning’s peaceful protests or during the night, police said. Demonstrators are demanding the authorities sign an agreement on association and free trade with the EU. The government last week suspended preparations for the signing. Clashes between Libyan troops and militants in the eastern city of Benghazi on Monday killed at least three people and wounded a dozen more, officials said. Gunfire and explosions were heard in Benghazi and smoke rose from the Ras Obeida area, Reuters reported. Fighting broke out when an army special forces unit pursued a suspect into an area where Islamist militant group Ansar Al-Sharia operates its own checkpoints. A year ago, the group was blamed for the attack on the US consulate in Benghazi when the US ambassador and three other Americans were killed. About 40 anti-government protesters forced their way into Thailand’s Finance Ministry on Monday, Reuters reported. The move followed a march of more than 30,000 of demonstrators to 12 buildings in Bangkok seeking to overthrow Prime Minister Yingluck Shinawatra. The building’s power was cut shortly after protesters burst into the ministry, according to a witness. Demonstrators spread across the city on Monday to government offices, military and naval bases and state TV channels to stop the alleged influence of the deposed former Prime Minister Thaksin Shinawatra. A team of experts formed by the International Atomic Energy Agency began Monday reviewing the efforts to scrap the crippled reactors at Fukushima Daiichi nuclear power plant. The IAEA team will focus on the management of the radioactive water buildup at the site and fuel removal work that has just started at a pool inside the damaged No. 4 reactor building, Kyodo quoted team leader Juan Carlos Lentijo as saying in Tokyo.“The removal of the spent fuel is an essential activity toward decommissioning,” Lentijo said. The full process that TEPCO has developed will be reviewed, as well as all the precautions adopted to develop these activities in a safe way. A Saudi court has sentenced one man to death and another 19 to jail terms ranging from 18 months to 25 years for storming the US consulate in Jeddah in 2004, Reuters reported. Another 35 defendants in the case will be sentenced on Monday and Tuesday. In the December 6 attack, five militants stormed the US consulate with bombs and guns, killing four Saudi security personnel and five local staff. Three of the attackers were killed and two were captured. The attack was seen as part of an Al-Qaeda campaign aimed at ousting the ruling Al Saud family. The campaign was crushed in 2006, with more than 11,000 people being detained. China has send formal letters of protest to Japanese and US embassies in Beijing, after both countries criticized China’s move to create the East China Sea Air Defense Identification Zone over islands disputed with Japan, China’s Defense Ministry said on Monday. The accusations toward China are “absolutely groundless and unacceptable,” ministry’s spokesman Yang Yujun said. On Saturday PRC said that any Japanese planes in the vicinity of Senkaku/ Diaoyu Islands need to submit their flight patterns to China’s Foreign Ministry or civil aviation administration and they must maintain radio contact with Chinese authorities, as the country introduced the East China Sea Air Defense Identification Zone. Ukrainian Prime Minister Nikolay Azarov says Moscow is considering reviewing a 2009 gas contract that Kiev believes to be unfavorable. “We have been persistently trying to persuade the Russian Federation to review the contract,” Azarov told Ukrainian TV channel ICTV. “Now, generally speaking, there is such a pledge, and we hope we will implement it during the talks.” Ukraine considers the gas contract signed in 2009 by then-Russian and Ukrainian prime ministers Vladimir Putin and Yulia Tymoshenko as financially unfavorable. Ukraine repeatedly warned that if Gazprom refuses to revise the contract, it would stop importing gas from Russia. New Delhi, November 25, 2013: The Indian Media Centre strongly condemns the prima facie serious case of sexual harassment of a young woman journalist by Tehelka Editor Tarun Tejpal and demands that the matter be probed thoroughly by the authorities concerned in the interests of probity in the media. No corporate or editorial head can set the terms of his own punishment. The magazine’s management should have taken prompt action on the basis of the Vishakha guidelines laid down by the Hon’ble Supreme Court of India. The malafide and serious dereliction of duty on the part of the management and its opting for an ‘internal inquiry’ in such a serious matter cannot be condoned and is not acceptable. It is a clear cut case of institutional failure and the law of the land must take its course. The unfortunate incident should also serve as a wakeup call for the entire media to institutionalize mechanisms where even the minutest instance of the violation of the Vishakha guidelines is taken congnizance of and it is ensured that the law takes it course. The Government on its part must notify the relevant laws with immediate effect and provide for a mechanism to ensure compliance. It is suggested that this work be entrusted to the National Commission for women. The IMC shall also be organizing a National Consultation on the issue with all stakeholders and like minded organizations in the near future. Indian Media Centre is an independent, non-profit institution dedicated to the highest standards in journalism – print, electronic and Internet. It has 16 chapters across the country.